I recently travelled to Israel with a group of thirty others, mostly from my parish of St. Mark the Evangelist Catholic Church, Hyattsville, Maryland. This nine-day pilgrimage did not turn out to be the reflective and sacred experience I anticipated. We saw beautiful and interesting things. We retraced many of Jesus’ steps, including his last steps as He carried his cross to Calvary. But initially I was disappointed—it was a hot, strenuous, and occasionally stressful slog, not the spiritual experience I had hoped for. Jerusalem is a big city with over 800,000 inhabitants, development, congestion, and tourists. Praying did not come easily, even at the holy sites. We travelled together by bus. I found myself feeling annoyed at some members of our group. One was too slow. Another took too many pictures. Yet another asked too many questions. I couldn’t hear the guide. I was tired, hot, and constipated. It seemed like the ultimate oxymoron. I was walking on sacred ground as part of a religious expedition, yet I was really struggling to be patient and loving. Then I realized I was experiencing the ingredients of an authentic pilgrimage. This was life as the disciples of Jesus may have experienced it--earthy, hot, and occasionally aggravating. I started to notice and be inspired by those in our group who went out of their way to be kind. My mind quieted, and I was then able to fully participate in the pilgrimage. In the end our group bonded. We climbed, trekked, sang, ate, laughed, cried, and prayed together. We got to where we were going. I think we all learned about ourselves and drew closer to our God. It doesn’t get much better than that. Seek out community, which has been described as a school for holiness. A diverse community like St. Marks offers many opportunities to practice patience, consideration, and generosity to those who are different from us. We can learn so much from each other. 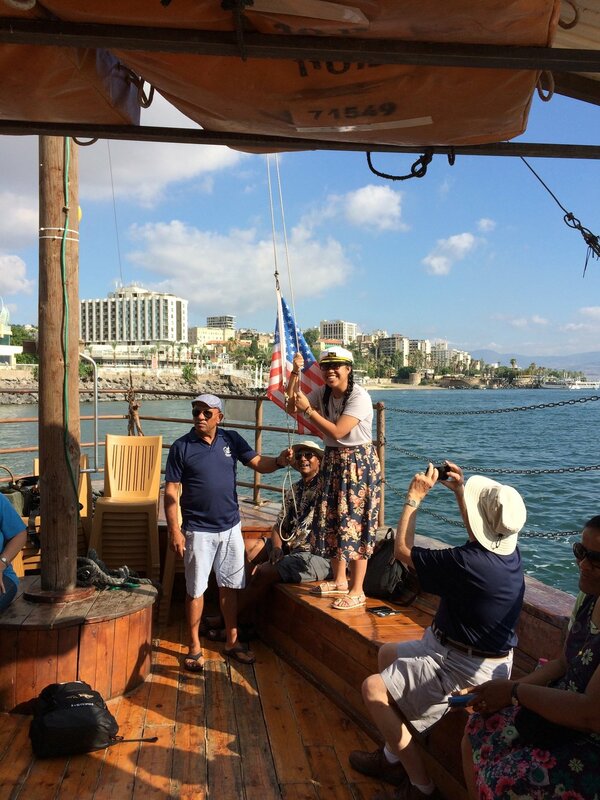 A patriotic moment on the Sea of Galilee. A selfie by our leader, Deacon Curtis Turner, as we celebrate after our Mass at the Church of the Beatitudes.